IF YOU'RE the biggest automotive group in the world's biggest domestic automotive market, then you attract attention when you open a new export front. Shanghai Automotive Industrial Corporation (SAIC) is about to launch a range of cargo vans in Australia that will barely show as a blip on the company's balance sheet, no matter how successful they are. But they'll still have a significant effect on the local market. LDV has a chequered past - born in the UK after a one-night stand in Korea and a torrid commercial affair between Leyland and DAF. The group reportedly sank into a financial abyss in 2009 and was acquired by a company owned by the daughter of a senior SAIC executive, who now has exclusive distribution rights in Europe. Phew! Neil Bamford is the CEO of WMC, the Australian distributor of LDV. "We're initially launching a three-model range of LDV V80 cargo vans followed by a number of passenger vans and cab chassis models later in 2013," he told Big Rigs. The line-up includes a single short wheelbase variant as well as long wheel base cargo vans with the choice of either a mid roof height or a high roof version. Load capacities range between nine and 12 cubic metres and a there's a payload potential of up to 1.8 tonnes. ANCAP hasn't driven one into a wall yet but the vans apparently meet European crash and safety standards. 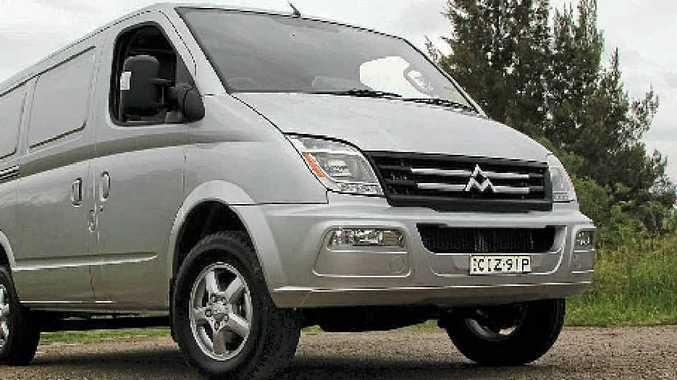 All models in the initial LDV V80 range are powered by a 2.5L VM Motori double overhead camshaft common rail turbo diesel designed in Italy and built under license in China. It produces maximum power of 100kW at 3500rpm and a maximum 330Nm of torque at 2200rpm, and claims a combined average fuel economy of just 7.7L/100km for the short wheelbase variant. A five-speed manual transmission is standard, with an auto box planned for later in 2013. The front end is standard European fare - Macpherson strut with spring over shock design with twin parabolic leaf springs at the rear. Drivers get an eight-way adjustment on the driver's seat and airbags are standard across the range. There's USB and auxiliary connectivity but no Bluetooth yet. Parking sensors are standard for reversing, headlights are crystal diamond LEDs with four-way electric height adjustment and LED-driving lights positioned along the lower edge of the main headlight fitting. Front fog lamps round out the lighting. But all openings will allow a standard pallet to be loaded. The cargo capacity is up to 11.62 cubic metres (LWB) for a load capacity of up to 1800kg and includes seven integrated tie down points in the SWB model and nine in the LWB. LDV is also fitted with a 12 volt DC to 220 volt AC inverter in the front of the cargo area enabling users to charge laptops or power a portable fridge while on the go.